How to enable google 2FA (Two factor Authentication) in ezeelogin ? 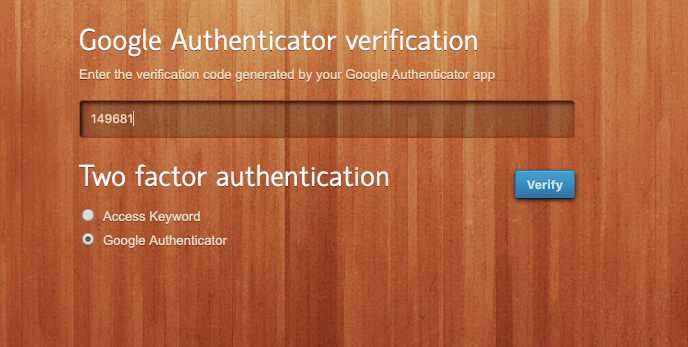 The backend 2fa method will also be now using Google Authenticator. Ensure that the time on the Jump server is accurate. Use the command #ntpdate pool.ntp.org to sync the server time. Also, do ensure that the mobile phone times are also in sync with your mobile operator time. Posted - Mon, Oct 9, 2017 at 3:05 AM. This article has been viewed 1921 times. How do i configure Ezeelogin to authenticate using Windows_AD(Pam-Ldap) in ubuntu? When I start typing for the device name, ip in the backend ther devices doesn’t disappear from the search result. What setting to be changed in jump server configuration file if mysql is listening on a different port? How to install free SSL with Let’s Encrypt? How can i add more than one public key to ezeelogin user ? How to reset cluster keys in ezeelogin Master-slave Configuration ? How do i configure Ezeelogin to authenticate using OpenLdap(Pam-Ldap) in centos ? How can i disable MySQL strict mode ? How to configure Yubikey two factor authentication in ssh ? Can we map existing user group in ldap to ezeelogin as ezeelogin user group ? Can i install ezeelogin Jump server solution in a lan? what port should i open on my server firewall to fetch ezeelogin license? crons for changing root passwords on servers periodically and managing ssh user logs. Will Ezeelogin work behind a firewall or NAT or behind a Proxy? How do i configure Ezeelogin to authenticate using Windows_AD(Pam-Ldap) in centos? How do i configure Ezeelogin to authenticate using Open_Ldap(Pam-Ldap) in ubuntu? How do i configure Ezeelogin to authenticate using OpenLdap or Window AD server? How do i change the web url / uri of my installation? How can i reset password / security code ? How do i change the authentication from ldap to internal in the database? Setting in web panel when SSH Daemon is listening on non standard ports. How to install ssl certs in jump server(secure connection) ? How to bypass the group menu in the backend shell and go directly to the entire server listing? How to search using IP or other fields instead of host name in jump server ssh interface or gui? How can i reset the default global key ? How to pass environment variable through jump server?